Polling in the first of the three phases was held in 24 districts of the state in which mayoral elections were also held for five municipal corporations: Agra, Kanpur, Ayodhya, Gorakhpur and Meerut. LUCKNOW: Over 52 per cent voting was witnessed in the first phase of the Uttar Pradesh civic polls today with voters, including in Ayodhya, Gorakhpur and Amethi, seen queueing up at the polling stations to exercise their franchise. 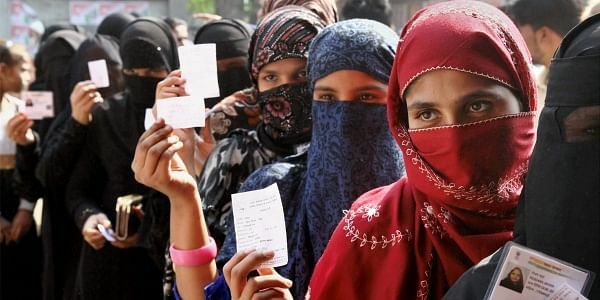 According to the official website of the UP State Election Commission, the overall polling percentage in the first phase stood at 52.85 per cent. In the 2012 civic elections, the polling percentage in these districts was 46.1 per cent. In Ayodhya, from where Uttar Pradesh Chief Minister Yogi Adityanath started his election campaign, voters exercised their rights to elect their first mayor. The Adityanath government after assuming office had constituted municipal corporations of Ayodhya and Vrindavan-Mathura. Polling in Faizabad district, which includes the newly constituted Ayodhya Municipal Corporation, was 54.08 per cent. This is almost 8 per cent higher than the 2012 mark. Gorakhpur recorded a polling of 39.23 percent, up 3 per cent compared to the 2012 polls. The highest polling during the first phase was recorded in Hamirpur, which witnessed 69.59 per cent turn out, followed by Amethi which saw 68.44 per cent polling. Agra recorded 43.11 per cent polling, while in Kanpur (Nagar), it was 44.92 per cent. Gorakhpur witnessed the lowest voters' turnout in the first phase. The districts which went to polls in the first of the three phase urban local bodies' polls are: Shamli(66.83 per cent), Meerut(54.09 per cent), Hapur(57.72 per cent), Bijnor (63.35 per cent), Badaun(60.89 per cent), Hathras(63.72 per cent), Kasganj(62.26 per cent), Agra(43.11 per cent), Kanpur Nagar (44.92 per cent), Jalaun(61.85 per cent), Hamirpur(69.59 per cent), Chitrakoot (62.19 per cent), Kaushambi(65 per cent), Pratapgarh(61.51 per cent), Unnao(62.11 per cent), Hardoi (64.14 per cent), Amethi(68.44 per cent), Faizabad (54.08 per cent), Gonda(60.39 per cent), Basti(55.57 per cent), Gorakhpur(39.23 per cent), Azamgarh(59.44 per cent), Ghazipur (57.97 per cent) and Sonbhadra(57.71 per cent). The voters' turnout in the mayoral election in Gorakhpur was 35.62 per cent, while 49.98 per cent voters turned up in Faizabad to elect the first mayor of the Ayodhya Municipal Corporation. Polling for the other two phases will be held on November 26 and November 29, while counting of votes for all the three phases would be done on December 1. Briefing reporters here, State Election Commissioner SK Agarwal said, "Polling was absolutely peaceful. Webcasting, usage of CCTV cameras and intense monitoring was done to ensure peaceful poll. Re-polling has been ordered in a polling booth in Badaun, while a case has been registered against an independent candidate for violation of model code of conduct in Shamli. Two EVMs were replaced each in Meerut and Kanpur." He also claimed that due to revision of voter list, fake voters were removed. The ongoing urban local bodies' elections involving more than 3.3 crore voters in 75 districts of UP is being seen as a test for the Yogi Adityanath-led BJP government. The stakes are equally high for other parties including the Congress, SP and the BSP, which are hoping for a comeback after their drubbing in assembly elections early this year. The BSP is contesting the local bodies’ polls on the party symbol after 17 years. Among the early voters was Adityanath, who exercised his franchise by casting his ballot in Gorakhpur. The chief minister cast his vote at the polling centre in Kanya Primary Pathshala in ward number 68 in old Gorakhpur this morning. "The BJP will register a massive victory in these elections...The BJP candidates will win on all the seats," he said before leaving for Varanasi and Allahabad for campaigning for the remaining phases of the elections. Union minister Shiv Pratap Shukla cast his vote at the St. Andrew's College polling booth and exhorted people to use their right to vote in a big way. Shukla said that his party wanted to give more rights to Mayors of the municipal corporations for which it will also bring an amendment in the existing law. Meanwhile, in Unnao the names of sitting MP, Sakshi Maharaj, and former MP, Annu Tandon, were found missing from the voters' list. Maharaj who found that his name was not present in the voters' list at the Gadankheda polling booth termed it part of a conspiracy. "The DM is new but the ADM who is also looking after the election process is posted since the past government...it is not a mere lapse that the name of the MP is missing," Maharaj later told reporters. He demanded action against those guilty. Former Congress MP Tandon also hinted at some conspiracy and lodged a complaint with the district administration. Unnao district magistrate NG Ravi while terming both the cases as serious said that inquiry will be conducted and action will be taken against those responsible. Mahraj alleged that names of some others of his Gadankheda Sakshi Dham ashram were also missing.